Nutrition is essential to your performance during all types of exercise. The foods consumed in your diet are used to provide the body with enough energy to fuel an activity regardless of the intensity of activity. Athletes have different nutritional needs to support the vigorous level they compete and practice at. To determine an athletes nutritional needs, it is important to revisit the concept of energy metabolism. Energy intake is the foundation of an athlete’s diet because it supports optimal body functions, determines the amount of intake of macronutrients and micronutrients, and assists in the maintaining of body composition. 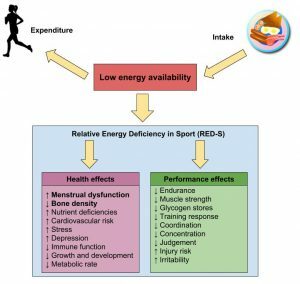 Energy needs for athletes increase depending on their energy expenditure. The energy expended during physical activity are contingent on the intensity, duration, and frequency of the exercise. Competitive athletes may need 3,000 to over 5,000 calories daily compared to a typical inactive individual who needs about 2,000 calories per day. Energy needs are also affected by an individual’s gender, age, and weight. Weight-bearing exercises, such as running, burn more calories per hour than non-weight bearing exercises, such as swimming. Weight-bearing exercises requires your body to move against gravity which requires more energy. Men are also able to burn more calories than women for the same activity because they have more muscle mass which requires more energy to support and move around. Body weight and composition can have a tremendous impact on exercise performance. Body weight and composition are considered the focal points of physique for athletes because they are the able to be manipulated the most. Energy intake can play a role in manipulating the physiques for athletes. For individuals competing in sports such as football and weight lifting, having a large amount of muscle mass and increased body weight may be beneficial. This can be obtained through a combination of increased energy intake, and protein. Although certain physiques are more advantageous for specific sports, it is important to remember that a single and rigid “optimal” body composition is not recommended for any group of athletes. The composition of macronutrients in the diet is a key factor in maximizing performance for athletes. Carbohydrates are an important fuel source for the brain and muscle during exercise. Carbohydrate storage in the liver and muscle cells are relatively limited and therefore it is important for athletes to consume enough carbohydrates from their diet. Carbohydrate needs should increase about 3-10 g/kg/day depending on the type of training or competition. See Table 16.1 “Daily Needs for Carbohydrate Fuel” for carbohydrate needs for athletes depending on the intensity of the exercise. Source: Nutrition and Athletic Performance. American College of Sports Medicine.Medicine & Science in Sports & Exercise. 2016; 48(3), 543- 568. https://journals.lww.com/acsm-msse/Fulltext/2016/03000/Nutrition_and_Athletic_Performance.25.aspx. Accessed March 17, 2018. Although protein accounts for only about 5% of energy expended, dietary protein is necessary to support metabolic reactions (that generate ATP), and to help muscles with maintenance, growth, and repair. During exercise, these metabolic reactions for generating ATP rely heavily on proteins such as enzymes and transport proteins. It is recommended that athletes consume 1.2 to 2.0 g/kg/day of proteins in order to support these functions. Higher intakes may also be needed for short periods of intense training or when reducing energy intake. See Table 16.2 “Recommended Protein Intakes for Athletes” below for a better representation of protein needs depending on extent of training and dietary sources. Source: Dietary Reference Intakes, 2002 ACSM/ADA/Dietitians of Canada Position Statement: Nutrition & Athletic Performance, 2001. Accessed March 17, 2018. For athletes, consuming sufficient amounts of calories to support their energy expenditure is vital to maintain health and body functions. When the energy intake for athletes does not meet the high demands of exercise, a syndrome referred to as relative deficiency in sport (RED-S) occurs. RED-S has a negative effect on performance and health in both male and female athletes as shown in Table 16.7 “Relative Energy Deficiency in Sport Effects”. Athletes in sports with weight classes, such as wrestling, may put their health at risk by rapid weight loss in order to hit a specific weight for a match. These athletes are vulnerable to eating disorders due to sporadic dieting (several of which will restrict energy intake). The long term effects of these practices can not only impair performance but also have serious repercussions such as heart and kidney function, temperature regulation and electrolyte balance problems. Of the RED-S consequences that occur from an energy intake deficiency, the two health effects that are of the greatest concern to female athletes are menstrual dysfunction and decreased bone density. 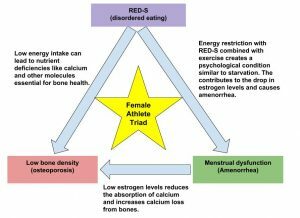 Menstrual dysfunction and low bone density symptoms of RED-S can create hormonal imbalances that are described in “Figure 16.8 The Female Athlete Triad”. In today’s society, there is increasing pressure to be extremely thin that some females take exercise too far. The low energy intakes will lead to the female athlete triad that causes bone loss, stoppage of menstrual periods, and eating disorders. Iron deficiency is very common in athletes. During exercise, iron-containing proteins like hemoglobin and myoglobin are needed in great amounts. An iron deficiency can impair muscle function to limit work capacity leading to compromised training performance. Some athletes in intense training may have an increase in iron losses through sweat, urine, and feces. Iron losses are greater in females than males due to the iron lost in blood every menstrual cycle. Female athletes, distance runners and vegetarians are at the greatest risk for developing iron deficiency. See Table 16.3 “The Potential Iron Loss in Endurance Athletes” for the potential amounts of iron loss each day in male and female athletes. An increased recommendation for both genders are shown below. These recommendations are based on the assumption that iron has a 10% absorption efficiency. As noted above, women athletes have a greater iron loss due to menstruation and therefore must increase their dietary needs more than male athletes. Source: Weaver CM, Rajaram S.Exercise and iron status. J Nutr. 1992 Mar;122(3 Suppl):782-7. https://www.ncbi.nlm.nih.gov/pubmed/1542048. Accessed March 23, 2018. Sports anemia, which is different from iron deficiency anemia is an adaptation to training for athletes. Excessive training causes the blood volume to expand in order to increase the amount of oxygen delivered to the muscles. During sports anemia, the synthesis of red blood cells lags behind the increase in blood volume which results in a decreased percentage of blood volume that is red blood cells. The total amount of red blood cells remains the same or may increase slightly to continue the transport of oxygen. Eventually as training progresses, the amount of red blood cells will increase to catch up with the total blood volume. Vitamin D regulates the calcium and phosphorus absorption and metabolism and plays a key role in maintaining optimal bone health. There is also growing evidence that vitamin D is important for other aspect of athletic performance such as injury prevention, rehabilitation, and muscle metabolism. Individuals who primarily practice indoors are at a larger risk for a vitamin D deficiency and should ensure they are consuming foods high in vitamin D to maintain sufficient vitamin D status. Calcium is especially important for the growth, maintenance, and repair of bone tissue. Low calcium intake occurs in athletes with RED-S, menstrual dysfunction, and those who avoid dairy products. A diet inadequate in calcium increases the risk for low bone mineral density which ultimately leads to stress fractures. Antioxidant nutrients play an important role in protecting cell membranes from oxidative damage. During exercise, the amount of oxygen used by the muscles increases and can produce free radicals which causes an increase in antioxidant systems in the the body. These antioxidant systems rely on the dietary antioxidants such as beta-carotene, vitamin C, vitamin E, and selenium that can be obtained through a nutrient dense diet. Sports Nutrition by University of Hawai’i at Mānoa Food Science and Human Nutrition Program is licensed under a Creative Commons Attribution-NonCommercial-ShareAlike 4.0 International License, except where otherwise noted.